The ancient gods, goddesses, and hieroglyphs of Egyptian culture have long attracted the curiosity of the outside world. Scientists and archaeologists from around the globe have traveled to Egypt to study its ancient ruins, tombs, and pyramids. 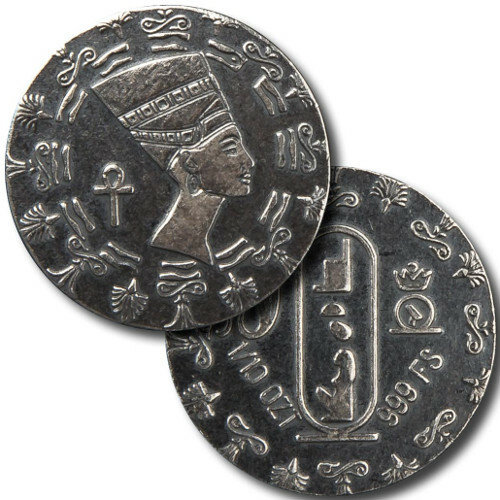 One of the most prominent figures from Ancient Egyptian history is Nefertiti, and her imagery in hieroglyphs comes to life now on a silver round from Monarch Precious Metals. 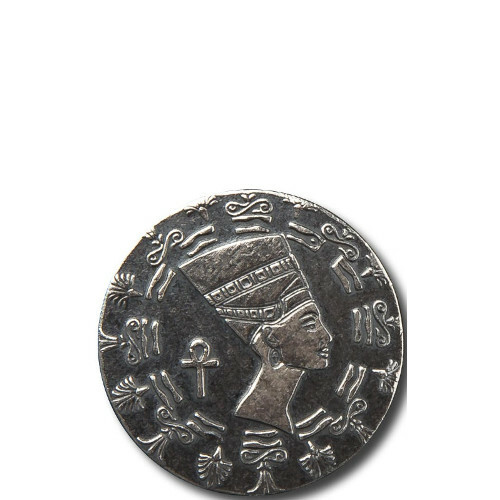 The 1/10 oz Silver Monarch Egyptian Nefertiti Round is available to you for purchase online at Silver.com. Ships to you in a flip for individual rounds or cotton muslin bags for multiples of 20. From the refineries Egyptian Silver Rounds theme! 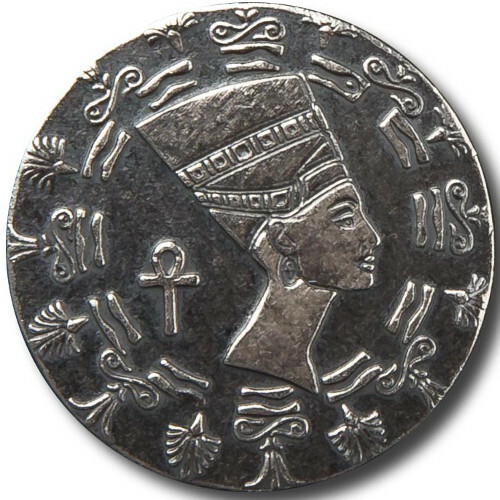 Queen Nefertiti’s image on the obverse. Egyptian hieroglyphs on the reverse. Monarch Precious Metals has quickly grown a reputation for producing truly unique silver products. All of its silver bars and rounds are produced using hand-poured techniques, with hand-stamped engravings for an extra special touch. 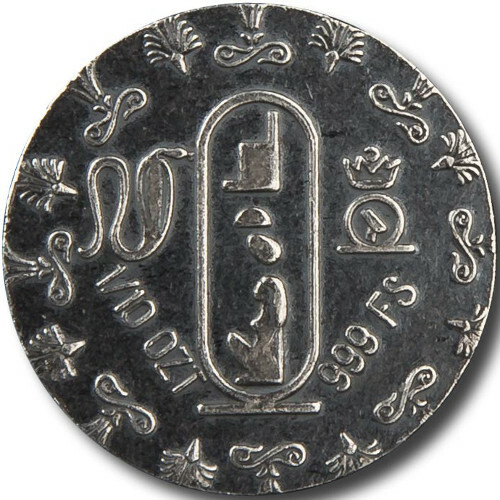 In the case of its Egyptian Silver Rounds, the ancient appeal is furthered by a purposeful off-center striking of each round’s design, which ensures unique character for each individual piece. On the obverse of each 1/10 oz Silver Monarch Egyptian Nefertiti Round is the right-profile bust of Nefertiti. This depiction of the Egyptian queen is taken from a famous bust of her created by the sculptor Thutmose, later found in his workshop. This bust is currently held in Berlin’s Neues Museum. Nefertiti was an Egyptian queen known as the Great Royal Wife of the Egyptian Pharaoh Akhenaten. She lived from 1370 BC to 1330 BC, and together with her husband was known for commencing a religious revolution in Egypt. In particular, they ushered in an era in which people worshipped only one god: Aten, the sun disc. The reverse of each of the silver rounds in this collection features a collection of hieroglyphs that reflect the writing style of Ancient Egyptians. 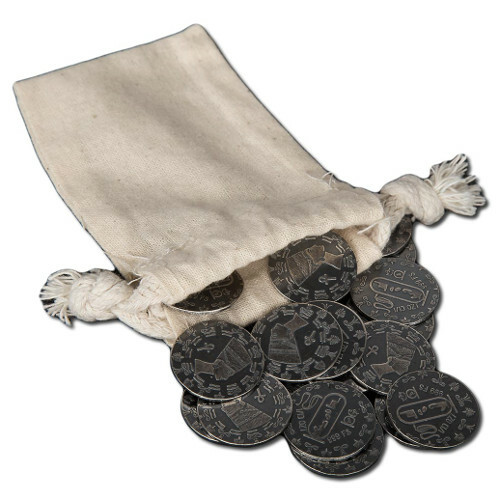 All of these rounds include an antique appearance that gives them the look and feel of ancient coinage. Monarch Precious Metals was founded in in 2008 in the Rogue Valley of southeastern Oregon. The refinery specializes in the production of gold and silver bars, and rounds, using .999 minimum purity in the content of all products. Everything from the refinery is hand-poured and hand-stamped. We encourage all Silver.com customers to contact us with questions about these silver rounds. You can reach our customer service team in three ways. We’re available on the phone at 888-989-7223, on the web using our live chat feature, and via our email address.